The internationally renowned Brentwood Rowing Club started by Tony Carr and John Queen, has a highly distinguished history that has produced 23 Olympians, including three gold medalists, and has had alumni appear in eleven straight Olympic games. More recent results include Malcolm Howard (Class of 2001) who was a member of Canada's gold medal winning men's eight in Beijing in 2008 as well as the silver medal winning eight in London in 2012. Scott Frandsen (Class of 1998) teamed up with fellow alum David Calder (Class of 1996) to win the silver medal in the men's pair in Beijing in 2008. Brentwood's medal total was good enough to finish 54th out of 204 countries! Each year the club hosts the Brentwood International Rowing Regatta entering its 48th year in 2018. This international event attracts teams from all parts of Canada, and the United State and from as far away as Mexico, and Australia. In the past, it has also had teams from as far away as Europe and Asia. In 2017, there were in excess of 4,000 people in attendance including over 1,700 athletes and coaches, and over 500 volunteers. All this showcases student-athletes in world-class racing in over 170 races, down the 1,500 metre course every 7 minutes for 23 hours over 3 days! Brentwood rowing attracts enthusiastic athletes who are interested in learning to row, or in further developing their skill, endurance, and performance on the water. A coaching staff that includes the 2007 North American Junior Coach of the Year, and a two-time Olympian from the women's team. Facilities include an indoor rowing tank, an enviably equipped boathouse, a large erg room with 40 ergometres, and an expanse of ocean: it is not surprising that our athletes continue to add hardware and glory to a program that has produced more than 120 national championships in the last 50 years. 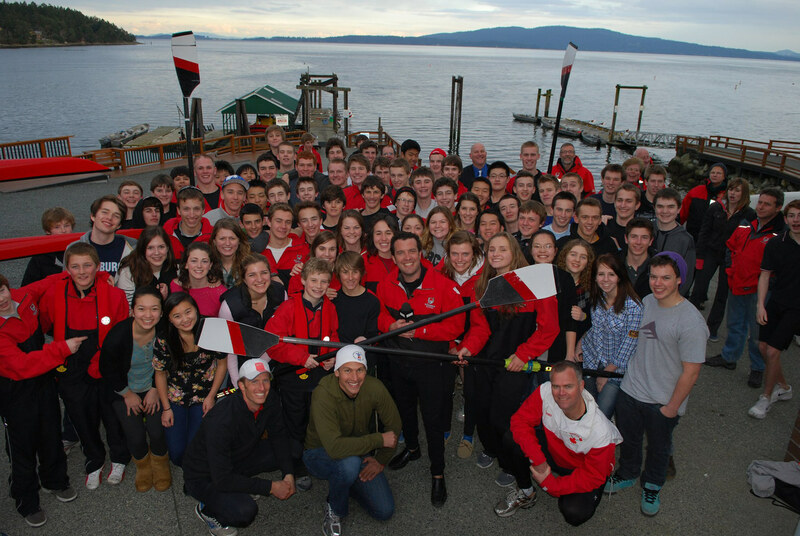 Brentwood sends crews to all of the local regattas, more often than not, to Opening Day and Head of the Lake in Seattle, as well as the Head of the Charles in Boston, USA. Each May, select crews also have a chance to travel to the Canadian High School Championships in St Catharines, Ontario. Brentwood has attended the famous Royal Henley Regatta in England several times, winning the Princess Elizabeth Challenge Cup in 1996. In 2007, the Brentwood crew lost in the final by a foot, which was considered by Rowing News, as the 'Race of the Year'. In the last 40 years, Brentwood rowers have left the school to attend some of the top universities in the world. These include the top schools in Canada, University of Washington, University of California Berkeley, and all the top Ivy League schools in the United States. Three students continued their studies to Oxford and Cambridge. Rowing is open to all male and female athletes. Training is also available for coxswains.